Labeling your quilts is a must! I have several antique quilts without labels or signatures and I am constantly curious who was the maker of the quilt and where was it made. It would be nice to know if it was made for somebody's wedding, or if scraps from clothing were used. Sometimes I'm in a hurry and use a permanent pen to write my name and the year on the back of the quilt, usually along the bottom right edge. Labeling your quilts is not a time consuming process. It should be done, after all it is your legacy. This is the label I made for the back of my "Romantic Hearts" quilt. Using a fine point permanent marker, I wrote the information I wanted on light colored cotton fabric and then hand appliqued the heart shape to the back of my quilt. You can purchase beautiful pre-printed fabric labels or make your own with muslin or light colored cotton. 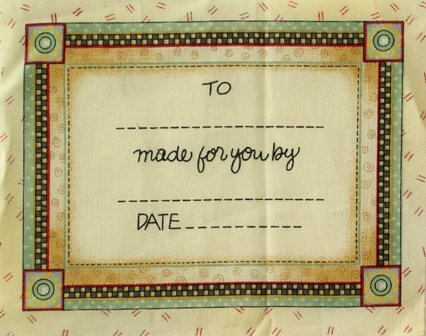 Again, use a permanent pen and write in the details of the quilt and quilter, you could also include the date. Permanent pens come in a great assortment of colors. Always practice on a scrap of your fabric, and make sure the ink doesn't bleed (smear), and that it is permanent. By ironing the label onto a piece of freezer paper, the fabric is stabilized and will not stretch when you write on it. Remove the freezer paper before attaching the label to the quilt. Embroidery, either by hand or machine, on a piece of muslin or light colored fabric also makes a great label. The new sewing machines that can create alphabets are wonderful for making labels. Some clever people use their computers to print a personalized label and stitch it to the back of the quilt. You can purchase ready to use fabric sheets to feed into your printer for just such a purpose. They make labeling your quilts easy. Occasionally quilts go missing whether by accident or theft. 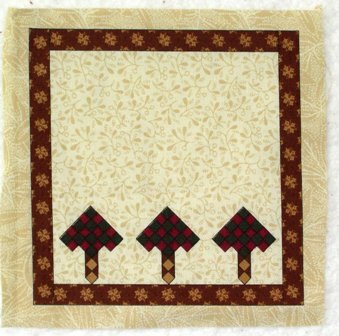 Some quilters like to stitch their label onto the back of the quilt before quilting, so that it is more difficult to remove. Alternatively, you can hand stitch the quilt label to the back of the quilt when the quilting is finished. date (usually the completion date or just a year). 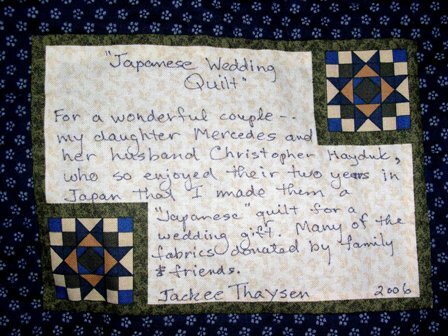 It is also very nice to include a note about why the quilt was made, especially if it was for a special occasion. This label is on the quilt that I made for my daughter's graduation from University. I used a purchased label and wrote a little story about why I made this quilt and also included all the necessary information. You can see by the dates that it took me two years to complete this project. 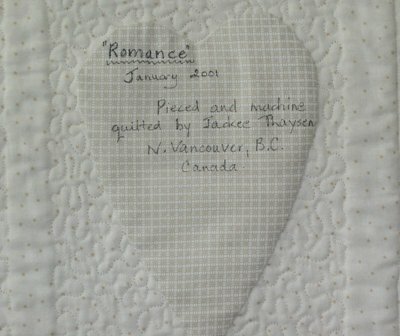 Again, I used a purchased label and wrote the reason for making the quilt, as well as my name and the year. Some people like to make a fabric "envelope" for the back of the quilt, to enclose bits from the top, in case it needs a wee repair later on. Finished with "Labeling Your Quilts"? Go to "Lesson 8 - Sleeves"